FOR LOGO PRINTING CLICK HERE! 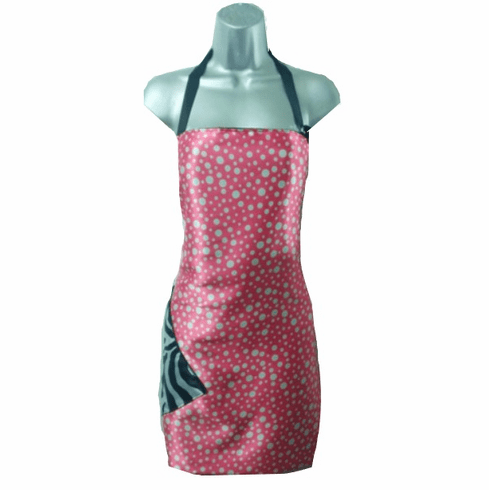 Our Pink Hairstylist Aprons is made of a double layer of synthetic material for maximum protection and durability. Because the salon apron is not cotton, there is no need to coat it with plastic. WATERPROOF and STAIN RESISTANT: Our cosmetology aprons are sealed with silicone. This is the same type of application that is used by Snowboarders to keep their clothing dry. Because the hair cutting apron material is synthetic, hair color does not stain. As all hairdressers know, you can't color or bleach synthetic hair. The same principle applies with our hair stylist apparel. WATCH STAINPROOF STYLIST APRON VIDEO DEMO " "
ADDITIONAL INFO +Hair will not stick to the Plus Size Hair Stylist Aprons ! +This cute stylist apron is WASHING MACHINE SAFE. +You can throw it in the dryer, but it will last longer if you hang to dry your stylist apron. +The pocket on this hair stylist apron is tilted for easy access and to cut down on the amount of hair that collects in the bottom of the pockets of most stylist aprons. The tips you make as a hair stylist will be safely secured in the deep pockets. +Because this stylist apron is made of a synthetic fabric, and treated with a sealant, the apron is waterproof and stain resistant.